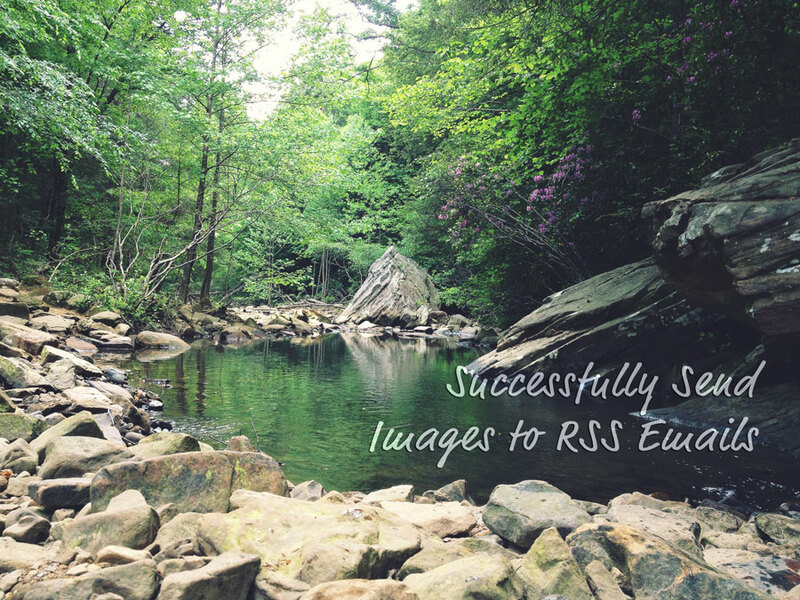 Update: Send Images to RSS is now available from the official WordPress plugin repository! Download Send Images to RSS. In my last post on RSS emails, I mentioned that there are issues with sending blog posts by email, specifically with what happens with your images. At this point, we can upload pretty large images to our websites, and the images will look great, regardless of what size screen our reader is using, especially since our websites are responsive and mobile friendly (if they’re not, why not?). However, email clients are much less forgiving, some more so than others, so when it comes time to send images to the RSS feed, there are some pitfalls lurking. For example, if you put galleries in your posts, those small thumbnail images are what is usually sent to the RSS feed, because that’s what’s in your content. This is true of the native WordPress galleries, and used to be true for NextGen (I haven’t used it in years, so I don’t know about that one at this point). I believe that Envira gets around this by sending just the first image of the gallery to the RSS feed, full size, which is better. However, marketing emails are usually about 600 pixels wide (on the outside)–that’s a pretty standard recommendation, due to the wide variety of email clients served, with more configurations than you can shake a stick at. Most of our websites are wider than that, and we love big images, so it’s usual to upload larger images to our sites (I tell my clients that 900 pixels wide is a nice size). And some clients, who may not know better, upload even larger images to their sites (which is another problem for another day). 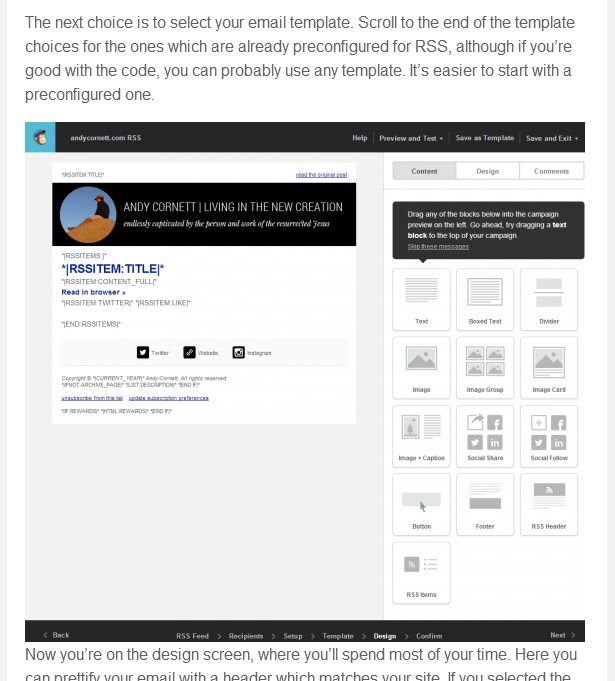 We can style images however we want on our sites, but our CSS is on our site, not in the RSS feed. Even image alignment is not passed on to the feed. MailChimp warns users who look deeply enough that Outlook is the chief among email offenders, and will show your image at its actual size, no matter what size your email is, or what size you ask it to use. So, if you upload a 4000 pixel wide image to your site (which you should not do anyway), if you don’t do anything else to it, you’ll blow up every email you send out by RSS. If you upload it and make minor modifications to your feed, you may be OK in some clients, but Outlook will still explode. Plus, that’s a huge image to be sharing online, friends. On CSS-Tricks, Chris Coyier wrote an article about this with a possible solution, which inspired me to work on a solution of my own. I combined Chris’ work with an approach originally written as a simple function for me by my friend Erik Teichmann several years ago, and have created a plugin which I believe tackles this issue pretty well. 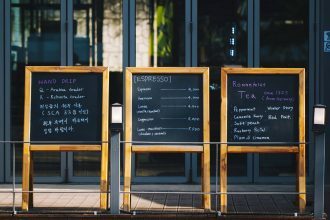 Originally, the plugin looked for images in the post content and, in the RSS feed, replaced smaller image sizes (such as thumbnails) with their full size counterparts. It also added a maximum width of 560 pixels to the images, so that they would fit nicely within the email, as long as the email client honored that width. However, this isn’t a foolproof approach, because what if the email client doesn’t honor it? I’ve named Outlook, but that’s not the only culprit. Also, if you (or your client) uploads absurdly large images, well, that’s absurdity going out by email. At this point, the improved plugin adds a new image size to your WordPress installation–any large image uploaded to your site will have a MailChimp sized image generated, in addition to the thumbnail, medium, and large. The plugin scans the images in your content, and if a MailChimp sized image exists, that is what is sent to the RSS feed, so your image will be perfectly sized for your emails. Smaller images are aligned even in your email. And that’s pretty much all the plugin does, friends. If you’d like to try it, I’d love for you to do so. Please understand, this plugin is a work in progress–depending on your server configuration and your own markup on your site, it may do wonky things to your feed, although I have attempted to account for this. So, if you install the plugin, please check and recheck your feed and your email output–and definitely make use of the test emails which MailChimp offers! If you are sending your blog posts out by email, and you ever post images on your site, I think you need this plugin. I am eating my own dog food on this one and am running this plugin on this site. So, if you’re curious to see the emails, go ahead and subscribe to receive mine. And if you use the plugin and have comments, issues, or questions, please let me know. And if it changes your life, I would love to know that as well. Hey Robin, can’t believe no one has commented on this yet! This solution is genius and saved my life on a client project involving MailChimp and RSS-to-email. Many thanks! So glad it’s helping you, Sara! I’m still working on improving it, so please let me know if you encounter anything unexpected. Thank you for the kind words. Great! Thanks for letting me know–I appreciate it! I just found your plugin through the help forum on Studiopress. Finally the featured image shows up. 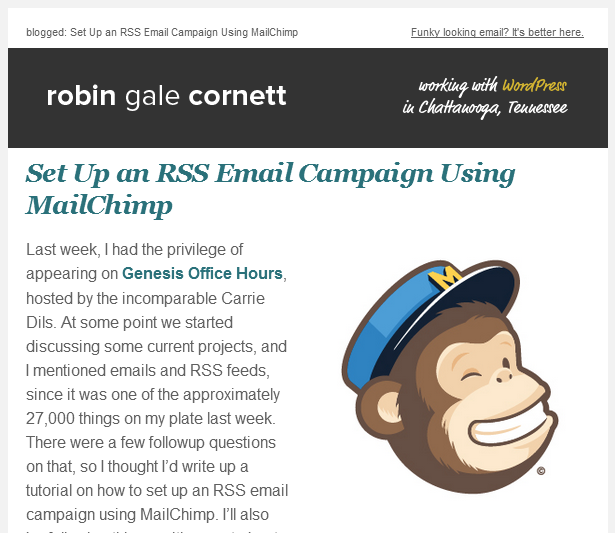 While I haven’t yet looked on Outlook (shudder to imagine what i might find), I noticed that the portrait oriented feature image (which is also inserted into the post at a small size), it being resized to fit in the test RSS email I sent from Mailchimp. The width is the width of the email, and the height was squashed down to make it into a landscape proportioned image. Is this a setting to tweak somewhere? Hey Liz, I do not think the plugin is responsible for that one, but I’d have to see the feed in question to know for sure. One thing to check would be the first note on the plugin FAQ page, regarding a new setting MailChimp has added to the RSS campaigns. I recommend turning that off, because it does not appear to take into account the actual size of the image. I’ve reported this to MailChimp and am hoping they’ll get it sorted, as I do think it’s on their end, but in the meantime, I do not advise using it (and it isn’t really necessary with the plugin). I don’t know if that’s where your issue actually is, but without seeing the feed, that’s the place I would look first. Oh my goodness you are a lifesaver! I’ve been racking my brains for the past couple of hours and I am so glad I found this page! It totally fixed the issue!